The biggest difference is that the new EVKB is using a different silicon. 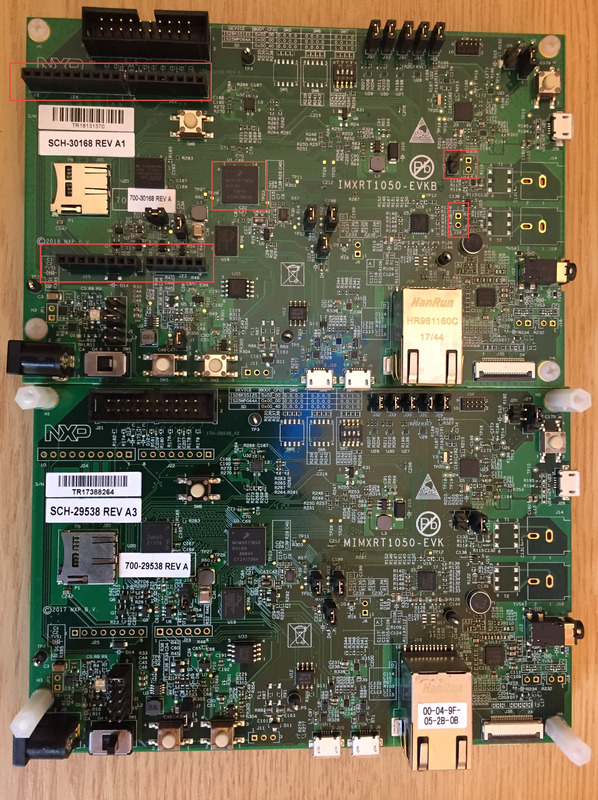 Reading the errata confirms some strange power issues I had observed with the EVK board: during development or startup the board did not respond any more, and I solved this with a) power on with the external power supply and then b) power the debug probe. 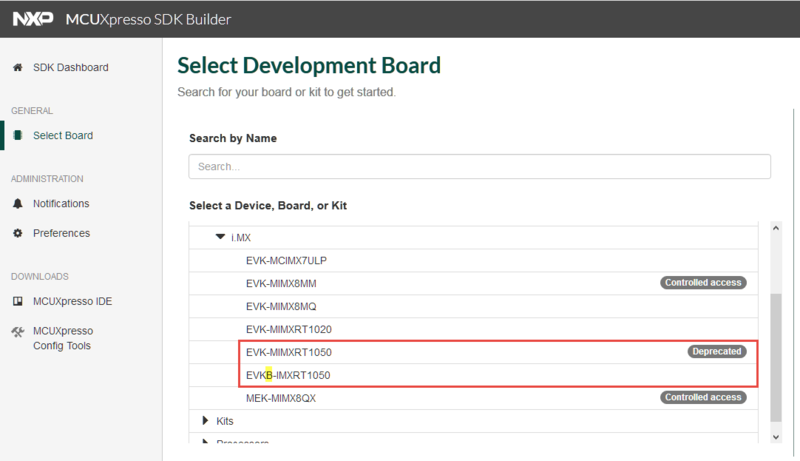 💡 NXP refers now the original EVK board as ‘EVKA’ to differentiate between EVK and EVKB. I’m continue to use EVK and EVKB as this is what is used in many places, so I hope you don’t get confused by this. 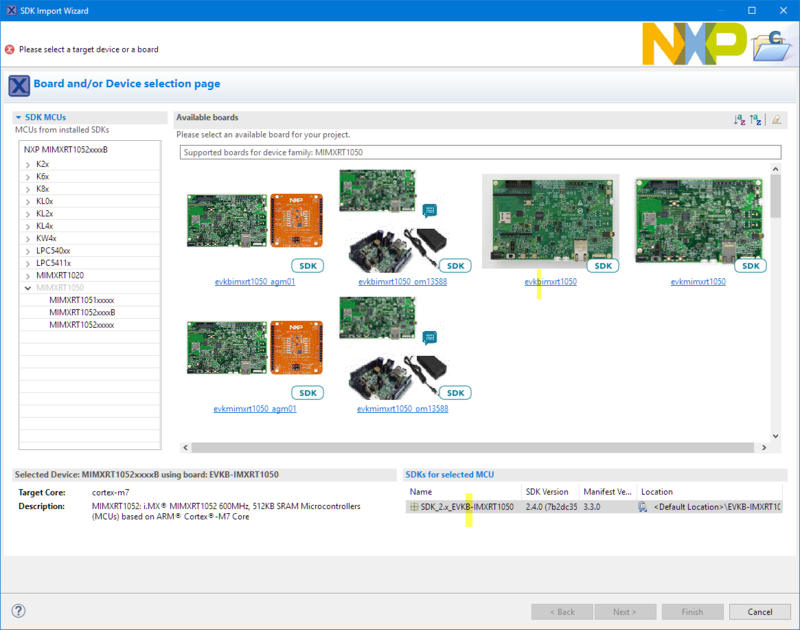 I recommend to have a read at the documents in https://community.nxp.com/community/mcuxpresso/mcuxpresso-ide/blog/2017/12/07/overview-of-using-the-mimxrt1050-evk-with-mcuxpresso-ide which gets frequently updated. EVKB has extra (unpopulated) header J38. J38 is used to disconnect the signal to the SPDIF (COAX) output. J15 is the same for the Coax input. Anyway both the coax connectors and circuit for it are not populated on both boards. J13 is used to power the SPDIF circuit. So these all are not really relevant to me. Having the Arduino headers populated is nice. But more important is the CPU silicon change. 💡 See https://www.nxp.com/docs/en/nxp/application-notes/AN12146.pdf for part numbers and decoder. The differences between A0 and A1 silicon are described in https://www.nxp.com/docs/en/nxp/application-notes/AN12146.pdf. Connecting the LCD is still a very challenge for the EVKB board. Having the Arduino headers populated is a nice addition, so I can start using my many Arduino shields right away. The most important change is the new silicon A1 revision which seems to solve some instabilities I have seen with the EVK board. I’ll keep my development running with both boards, but now in case of problems I can compare the EVKB with the EVK revision. And using the EVKB SDK even with the EVK board seems to be a good move too, as this somehow improved stability too. 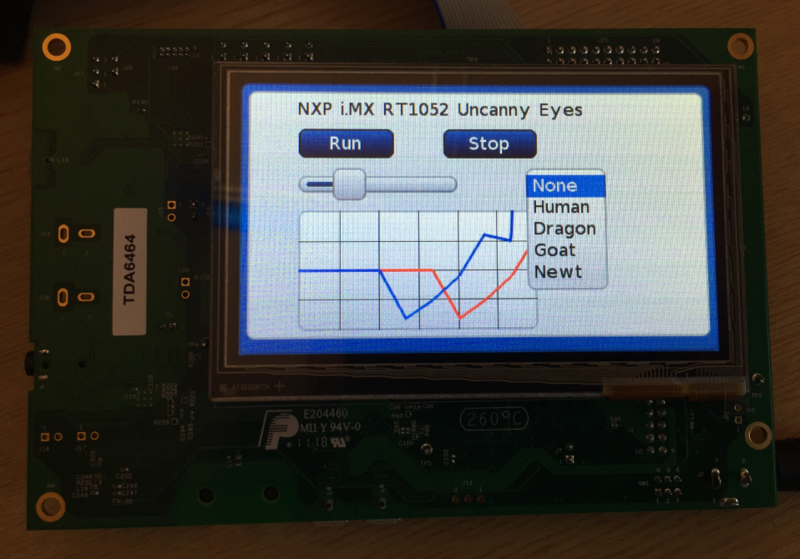 In any case, if you want to start using developing with i.MX RT1050, you should go for the EVKB board. And if you already have the EVK, it is probably the best if you get an EVKB too. 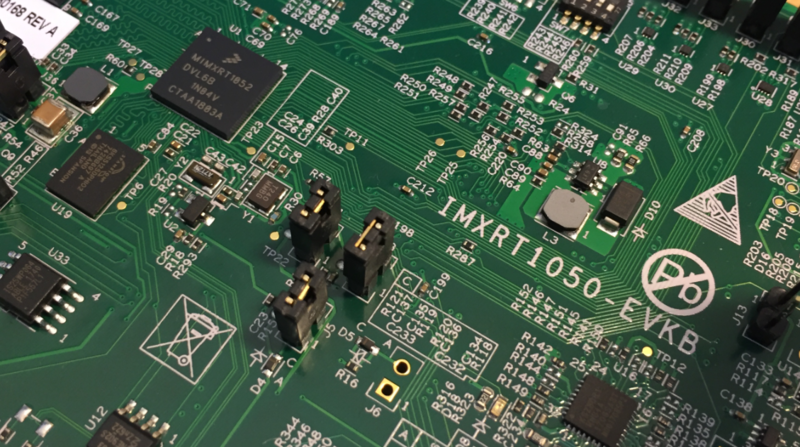 This entry was posted in ARM, Boards, CPU's, Embedded, i.Mx, MCUXpresso, MCUXpresso IDE, MCUXpresso SDK, MIMXRT1050-EVK, NXP, Thoughts and tagged ARM, Board, EVK, EVKB, i.Mx, i.MX RT1050 EVK, MCUXpresso, MCUXpresso IDE, NXP, OpenSDA, RT1050, RT1051, technology by Erich Styger. Bookmark the permalink. This open source GUI is maybe LittlevGL ?